If you unarchive the zip file in Switch, you will always get a folder with single files and not a folder with other folders inside. If you foresee a situation where you do not know how many subfolders there will be, then please contact us for further assistance. Enfocus Switch works with folders and files, so a job can be a folder or a file. If you want to process a file in Photoshop, for example, you will have to make sure that the incoming job is a jpg or tiff file type. Sending a folder to Photoshop will trigger a problem job event. Select the connection between “Sort” and “Unarchive” and go to the properties. Scroll down till you find your file type, select it, click on “Add >”. Your file type should end up in the right side block. Click on “OK” to save. Select the connection between “Sort” and “Files or Folders” and go to the properties. Next to “Include these jobs” click on the > button. Select “All other jobs”. All zip files are going to the Unarchive element and all other files are going directly to the next step. Next to “Include these jobs” click on the > button. 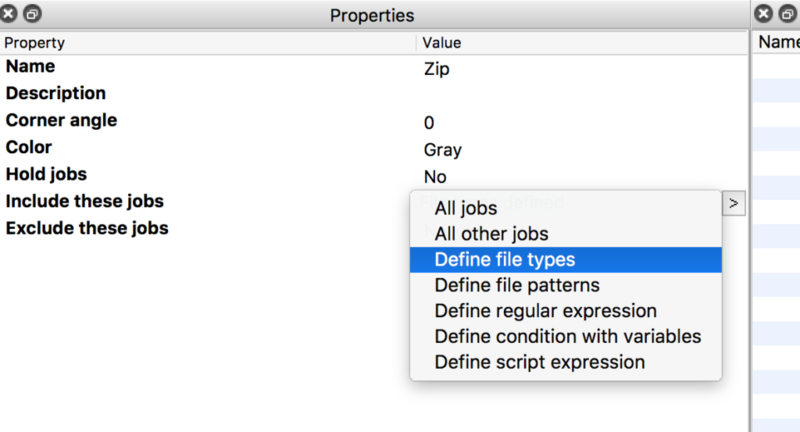 Select “Define file types”. 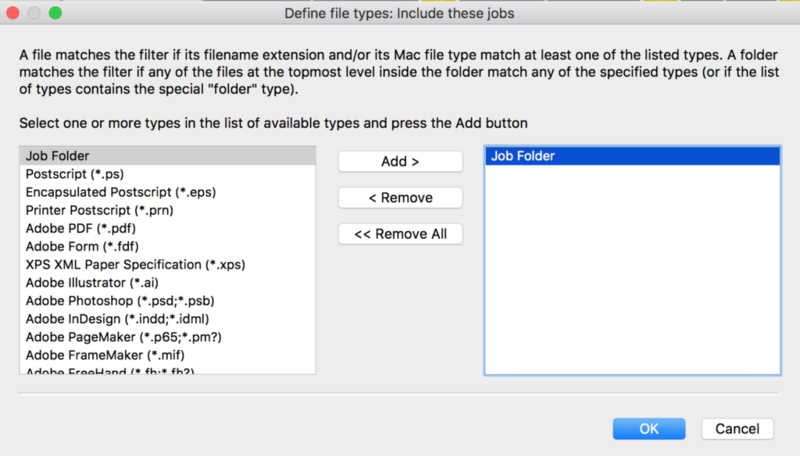 You need to go into the same panel as you did when setting up the zip file, but now in the list you search for Job folder, which is the first one in the list. 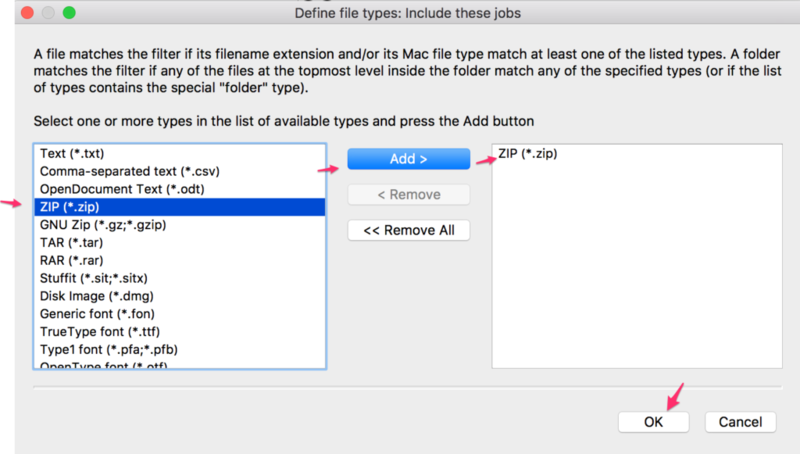 Configure this connection to route “All other jobs” as explained previously for this connection: “From “Sort” to “Files or Folders”. The Ungroup element does not need any configuration for this workflow. It makes the folder disappear and the result is single files. As soon as you set this up, your files, folders and zip files will get processed and routed to the correct processes and your result will be single files. So, assuming you want to process PDF files then you send them to Enfocus PitStop Server, and if you want to process images then you send them to Adobe Photoshop. This or this could be your next step. Imagine having this solution if you are currently doing these steps manually. Enfocus Switch only requires a one-time setup. The job gets done while you are working on other tasks, which will improve your productivity, customer service and many other aspects of your work. If you’d like to learn more about Enfocus Switch or schedule a demo then please contact us today.